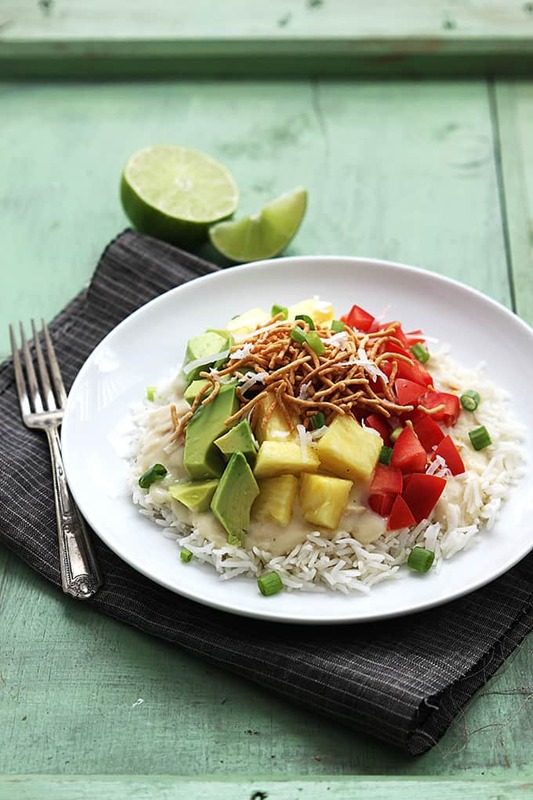 Slow Cooker Hawaiian Haystacks are a staple family favorite. 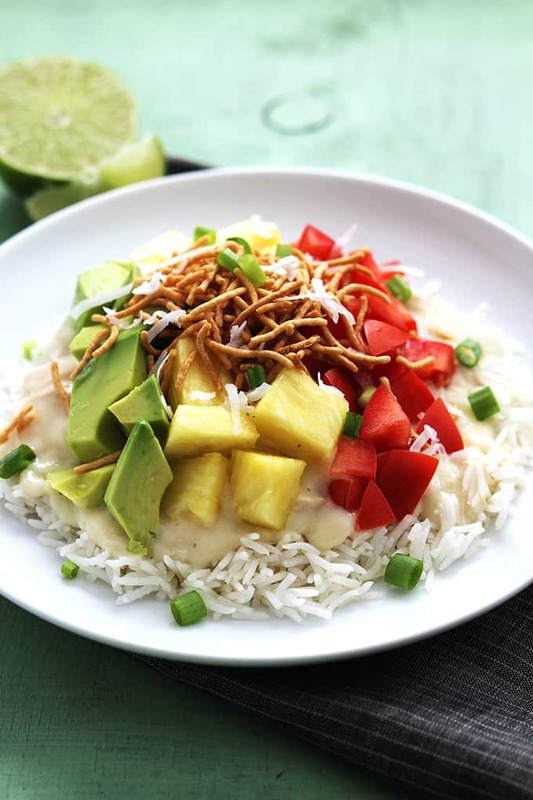 This crockpot version is healthy, made without cream of soup, and completely customizable with all of your favorite toppings! 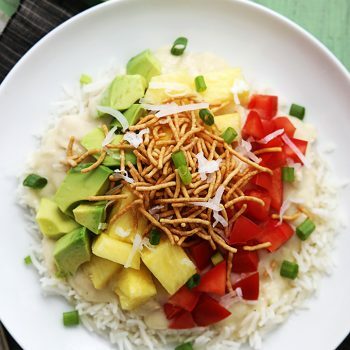 I still remember the first time I ever had Hawaiian haystacks. When I was probably 10 years old, my parents dragged me along to a wedding reception. The wedding was for some family friends who are Polynesian. Most of the wedding receptions I’ve been to have just served desserts or appetizers, mine included, but I’ll tell ya, Polynesians sure know how to do it. They served Hawaiian haystacks for dinner to all of the guests with every possible topping you can imagine. Those haystacks were pork, so they were a little bit different than the recipe I’m sharing today, but the idea is still the same with chicken. Feeding a family can be tricky. I like everything super melt-your-mouth-spicy, my husband likes everything heavy on the sauce, and if we ever had a kid he’d be one of those “no green things” children I’m sure of it. So customizable meals like this one are just the thing for busy families. For instance, a lot of people like to put olives on their haystacks. My husband and I hate olives so we ditch those and toss on some diced avocado instead. Pineapple is pretty standard but as for everything else, just go by what your preferences are and you can’t go wrong. This time of year my crockpot and I are basically glued at the hip (if crockpots had hips….) I just love the no-fuss meals you can make and the variety of slow cooker comfort foods are endlessssssss. This is one of those comfort foods. Easy to make, fun to eat, pleasing to everybody, and bonus: it’s healthy! There’s no cream of soup anything in this recipe, just simple ingredients you’ve got in the pantry already. If you’re looking for a new go-to busy weeknight meal this is just the thing to bring something new and delicious to the dinner table. 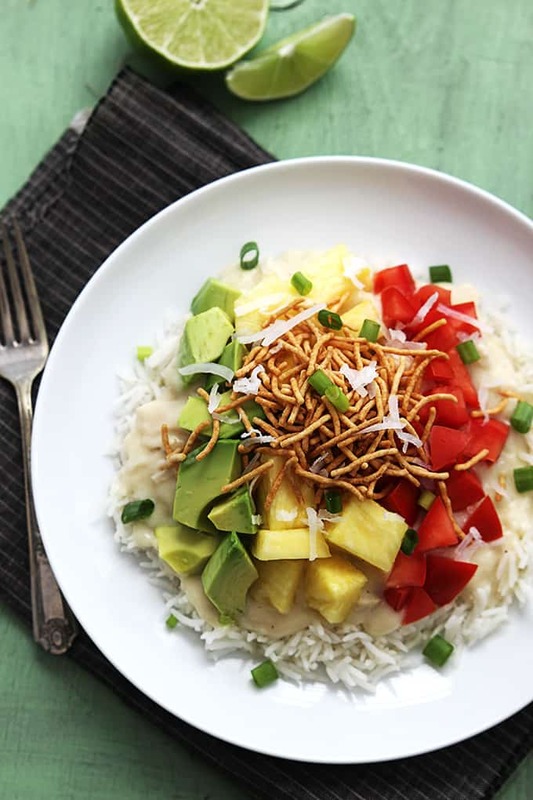 Hawaiian haystacks are a family favorite. 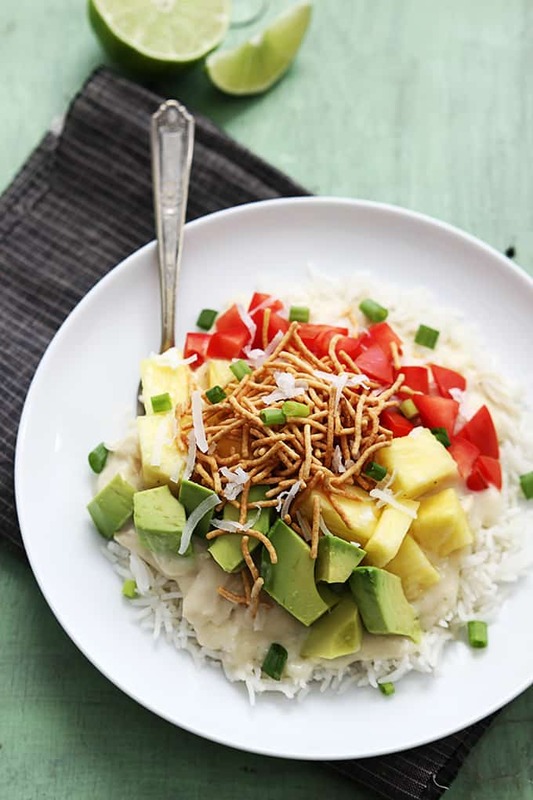 This crockpot version is healthy, made without cream of soup, and completely customizable with all of your favorite toppings! Fill your slow cooker with 2 cups chicken broth. Add chicken breasts. Cover and cook for 2 hours on high or 4 hours on low. About 20 minutes before serving, shred the chicken with two forks and keep in slow cooker. Add flour to pan. In a medium sauce pan on the stove melt butter, stir in garlic until fragrant, then sprinkle in flour and stir. Slowly whisk in remaining 2 cups chicken broth and milk and stir until mixture clumps up. When mixture is thickened, stir in onion powder and salt. Add cream mixture to slow cooker and stir to coat chicken. Cook for another 15 minutes. 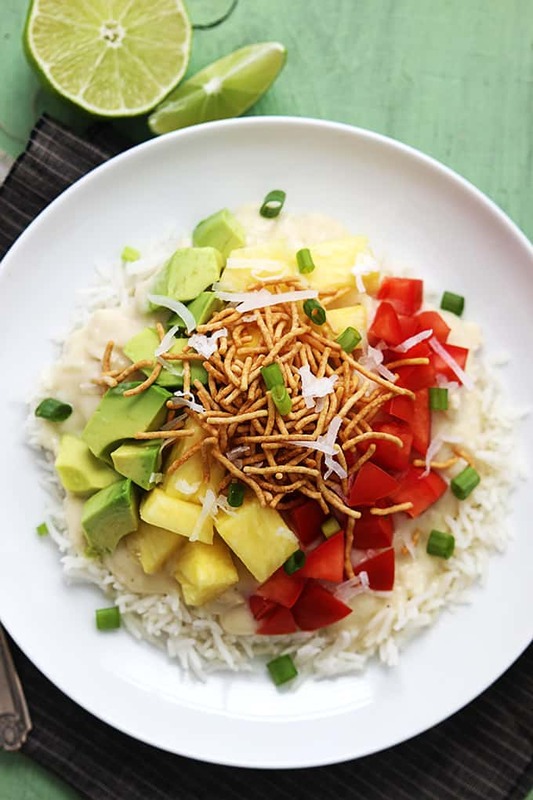 Serve over rice with your favorite toppings. This looks great – never tried this or heard of it but love all the textures Tiffany! You have 2 cups of chicken broth listed in the ingredients list twice. Just checking to make sure, do I need 2 or 4 cups of chicken broth for this recipe? My sauce was super thin and runny! Where did I go wrong?! I’m wondering, when you cook the chicken in the broth in the crock pot, are you supposed to get rid of the extra broth that’s leftover after the chicken is cooked?! or do you add the sauce mixture to the broth?! I had this same question. I love the flavor of this recipe, but am also wondering about the consistency. I think it works better to transfer the icken from the crock pot to the sauce pan, otherwise, its very runny! I got a little lost on step 3. It days to add flour to pan (what pan?) And stir until mixture CLumps up. What are we mixing it with to make it clump? My sauce did not thicken up at all, either. Guide me, obiwon! Hi Chelsea- that was a jumbled up typo! Thanks for pointing that out. It should all be fixed now! You have butter and garlic listeD in the ingredients but no intruction on wHen to add. Am i mIssing something? Hi Tori- thanks for pointing out that mistake! It is fixed now.